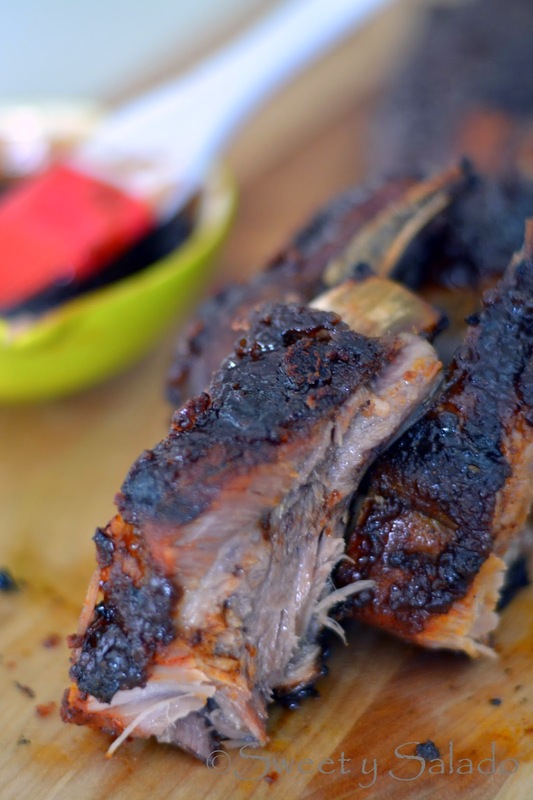 It is summer time and my husband and I have already made these bbq ribs three times. And the reason I say “we” is because I take care of seasoning the ribs and baking them and he usually takes care of the grilling. You know, that whole fascination men have with fire. These are fall of the bone fantastic and the sauce we baste them with makes them even better. Of course, you can use the bbq sauce of your choice, but the recipe I have for the one I usually use for these ribs is perfection. I have tried many different recipes for making ribs and I actually have a few favorites in my recipe binder that I use from time to time, but I always end up making this one almost every single time, mainly because of the dry rub. In my opinion, a good set of ribs has to be seasoned well and not just with salt and pepper but with a combination of great spices so that when you take a bite, you get an explosion of flavors in an instant. And this recipe has it all. I hope you give this a try and end up loving it as much as we do. 1. Mix all the dry rub ingredients in a small bowl and set aside. 2. Rinse both slabs of baby back ribs and dry well with paper towels. With the help of a small knife and dry paper towels, peel off the membrane that is attached to the back of the ribs. If you want you can also cut each slab into 3-4 portions or keep them as is. 3. Place the ribs meat side down on cookie/baking sheets covered with non stick aluminum foil. (If you don’t have non stick aluminum foil, use regular aluminum foil and cover with cooking spray or regular oil). Sprinkle the back of the ribs with ½ of the rub, flip over and sprinkle the front side with the remaining dry rub. Cover the ribs with more non stick aluminum foil and refrigerate for at least 4 hours, preferably overnight. 4. Take the ribs out of the fridge and let them sit at room temperature for about 20 minutes and bake them at 300ºF (150ºC) for 2 hours. 5. Pre-heat grill at medium high heat for about 7*8 minutes and take the ribs out of the oven. Oil the grill once it’s hot by soaking a paper towel with vegetable, corn or canola oil and then brushing it over it. 6. 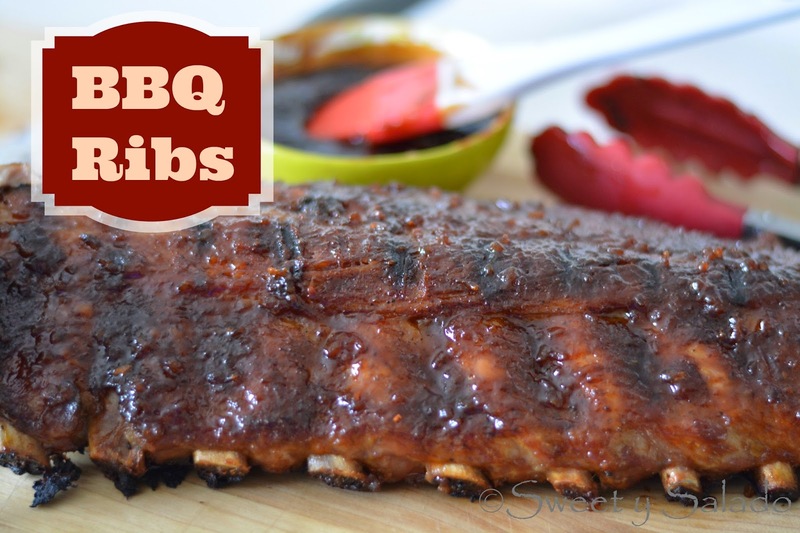 Place the ribs on the grill, meat side down and brush the back of the ribs with ½ of the bbq sauce. Cover the grill and cook for 7-8 minutes. 7. Uncover the grill, flip the ribs over and brush the meaty side of the ribs with the remaining of the bbq sauce. Cover again and cook for another 7-8 minutes. 8. Transfer the ribs to a cutting board and cut into portions if you had not done so already. Serve immediately with the remaining bbq sauce.